You should be able to use any True Type Font in an android app. Example using the font Script MT Bold. This font is in the Windows Font Folder. The font file name is SCRIPTBL.TTF. 1. copy SCRIPTBL.TTF to the project folder. If it is read only, right click in editor and turn off Read-Only. Save the file to the project folder. Don't change the file name. Then you can edit it in the Delphi editor. A. Add System.IOUtils to the uses clause. This will make it look for a font file by that name first. This is the name of the font file without the file extension. Don't put "SCRIPTBL.ttf" and don't put "Script MT Bold". You will have to type or paste it in to the property box. Note: filenames in Android are case sensitive, so you have to get them all the same. If the font family name is not the same as the file name of the font, you can just make a copy of the font file and rename it to the Font FamilyName and use that. 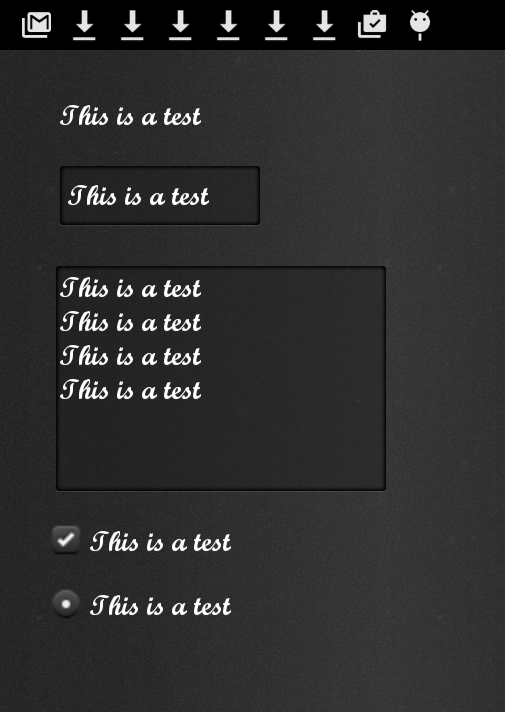 Then the font will show up at both design time and runtime. Can you attach an example of this project? I checked it for XE8 and it works the same. The FMX.FontGlyphs.Android.pas file is identical in XE6,XE7 and XE8. "if FileExists(FontFile) then" and see if it finds the file. If not, check out why not. Is the filename exactly the same? Did the file ever get deployed on there at all? Doug mate, I used your ideas to put the Tahoma font from windows across to a Samsung S5. I had to rename the font from tahoma to Tahoma, as every button etc had the capital. It worked beautifully. Then I tried as well to get the bold version, tahomabd, renamed to Tahomabd, with that as the family name. This did not work - it just went back to the android font. I tried it with tahomabd.ttf and it seemed to work fine. You sure you have the ".ttf" in the right case? I notice on Windows XP font folder it has the filename with upper case ".TTF". Thank you, Doug. Yes, the files were found. I think the problem is that the bold of Tahoma (and Arial, which I tried too) are so like the native Android font that I could not tell them apart. I used a serif font (Lucida Bright, Lbrite.ttf and Lbrited.ttf) and this worked fine, with no risk of mixing it up with the native sans-serif font! Do you have a project of this exemple? In my xe8 not work. (eg Tahomabd.ttf) for that. Unfortunately (certainly at 24 point) the native Android font, Arial Bold and Tahoma Bold all look the same, which is why I tried the sans serif font as I did not think it was working. Lucida Bright does not come with Windows - you could try Times New Roman = times.ttf, timesbd et cetera, and they should work. Good luck! If you can't get it to work with this, I will construct a test programme for the purpose and send it to you, if you like. Do you have a solution in Mac OS X? I can'y find a solution. '/Users/'+user_name+'/Library/Fonts/' and you can use it. Thank You It Works! But I have a problem. I use hungarian .ttf with Á,Í,É,etc... characters and it shows A,I,E in the app. The lower case characters (á,í,é) works fine. Is there a solution to fix it? I don't know. Do you know that those characters are in the font at the correct unicode position? Check the font in the Windows Character Map app and see if they are in the same numbered position as ttf that works in Windows. How are you inputting the characters, from the Android keyboard? I tested on the XE10 Seatle , Congratulations, excellent !!!! !